It's an ongoing struggle, but I'm off to a good start! I was super excited when Dr. Tutela of Tutela Plastic Surgery offered to treat me to a DermaCeutic peel. I've tried a ton of different types of peels (see here), which I liked and one I absolutely hated (see here) in the past. Going in, I had high expectations for my treatment this time, because I've done a peel by this brand in the past (see here) and my skin looked clean and bright afterwards. Exactly how I hoped it would look. This time around, I did step one of the DermaCeutic Mela Peel Forte for pigment spots, which consisted of salicylic acid, citric acid, azelaic acid, ferulic acid and phytic acid followed by their lactic acid based Milk Peel to further even out my skin tone. Immediately after, my face was pink and I left with a ton of product on it, but I was still able to go out in public without looking like a burn victim. Throughout the week following, my skin flaked instead of actually peeling and my chin broke out horribly (peels bring everything to the surface). My face continued to flake in different areas for almost two weeks (started at my mouth and nose, then chin, then forehead, then cheeks). I laid low for the first week, but didn't feel the need to stay in and hide. I did however, feel the need to explain the situation on my face to everyone I came encounter with. I tried a slew of products to keep the flaking situation under control and am beyond grateful for them, but on day six I felt completely out of control. 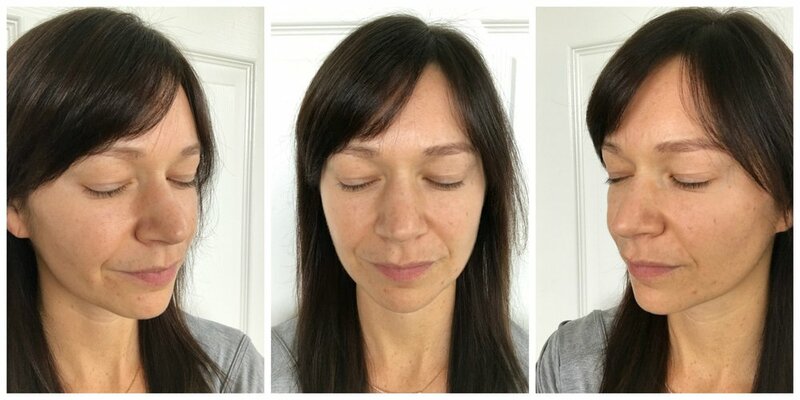 I booked an emergency facial with my aesthetician, Erica Cerpa of EC Beauty Studio in Hoboken, and she knew just what to do. After lots of nourishment, I started to see the light at the end of the tunnel. After two weeks, I took the images below. My hyperpigmentation is definitely lighter, but still apparent. And at this point, I still have healing acne on my chin, which is typically clear. For a perfectly spotless complexion, I would need to do a series of these peels monthly, but I think I'm going to take a more gentle route and stick with things I can do at home. I'm adding a brightening serum, SkinMedica Lytera, to my regimen and will keep up with my SPF. I will say, that when I applied makeup for TV this week, none of my spots showed through my tinted moisturizer, which is a big win! Watch my Facebook Live video with Dr. Tutela before my peel to learn more about him and chemical peels in general.